Ambergris Caye is a small island made by the Mayan people around 1,500 years ago in an effort to create alternate routes for their trading vessels. Visitors from the North sometimes refer to it as "La Isla Bonita" because there are few other cultural references available to capture the natural and cultural wonders of the most popular tourist location in Belize. There are many reasons people visit San Pedro Belize on Ambergris Caye island, and everyone leaves with a different vision of paradise. Long-term tourists come back year after year, often purchasing rental share in the condos at Grand Baymen, because there is far more than can possibly be experienced in one trip. San Pedro is the only dense habitation on the island, and it is possible to plan a trip without the barest glimpse of the place. It does suffer some of the problems of small cities with many people, most notably traffic congestion, but it also contains the best opportunities for arranging diving trips, wilderness expeditions, and tours of the remnants of Mayan civilization. It holds several surprises for the intrepid adventurer as well. Despite congestion, or perhaps contributing to it, the most common methods of travel in San Pedro are by golf cart and bicycle. Once upon a time, the principal industry here was fishing, and most of the architecture still reflects this. No building stands taller than the coco palm, which is the de facto local tree, and most residences are small homes painted in bright colors. A walk through the streets is a walk through sand, and locals will joke with tourists about finally finding a place to stretch out their beach blankets. The beaches themselves, which San Pedro is located on, are very narrow with hardly enough room to lay lengthwise at low tide. It is entirely safe to eat and drink the local fare when you visit San Pedro Belize on Ambergris Caye island. The water supplies are exclusively sourced from rainwater cisterns. All the larger restaurants and hotels can be found along Front Street, which is separated from the ocean by a small seawall and the thin beach. A close look at the water shows the nearness of the second largest barrier reef in the world. Further inland is the busier Middle Street with smaller restaurants serving locals and budget hotels. Construction in San Pedro is often interrupted by archaeological finds, the most common being burial sites. A casual tour of San Pedro will introduce visitors to curious blank mounds. This rich dirt used by locals for gardening, and they almost always hold the remains of Mayan thatch homes underneath. Archaeologists still do not understand how or why the former homes are found underneath these mounds. For those interested, there is a museum and preserved ruins to the south of San Pedro called the Marco Gonzalez site.Â Answers to questions about the history and wildlife of the island can also be found north of San Pedro at the Bacalar Chico wildlife reserve and in the town from the numerous tour guides. It is easy to believe Madonna was singing about Ambergris Caye and San Pedro in her popular song "La Isla Bonita". Visitors should definitely take the time to explore the romantic and friendly atmosphere of the island in the traditional manner of walking or cycling. 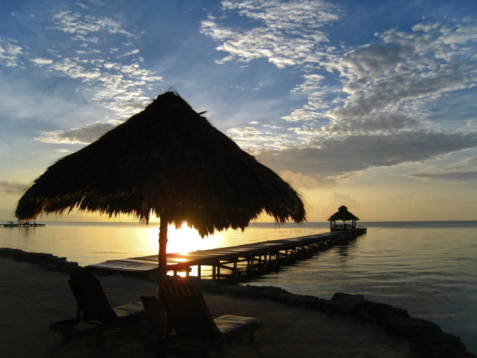 Visit San Pedro Belize on Amergris Caye island, and you'll find it worthwhile to invest in lodging with Grand Baymen.